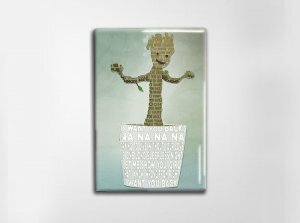 Each of these magnets measures approximately 2x3 inches and the image is made entirely of text! 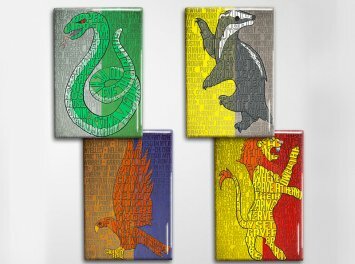 The four magnets show the house animal and colors of each House of Hogwarts, formed with the Sorting Hat's verse about that house, plus the names of House Members. Please note the text is small on these magnets. For more reading fun, each of these is also available as an 11x17 print or a theatrical-size poster. These magnets are perfect for the fridge, the office, or locker. A fun little gift to tuck into a greeting card your favorite Harry Potter fan will appreciate. 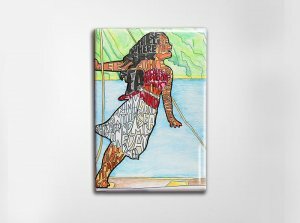 Each magnet is designed, printed, stamped, packaged, and shipped with care by an independent artist. Thank you for your support!